I went to the orchestra concert today put on by the college orchestra at St. Paul’s Lutheran Church. This is a photo of Tim Cook, one of the violin soloists during the concert (though this is not a photo of him playing a solo). 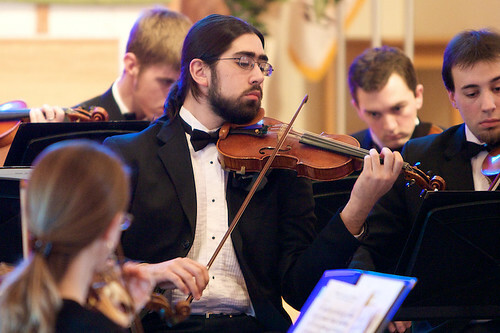 The orchestra played pieces by Strauss, Bach, Gabrieli, and Tchaikovsky. Even to someone like me who is not a classical music person, they did a wonderful job. By the way, the strange blue outline around everything came from the massive stained glass window in the Sanctuary. I am spending the rest of the evening finishing up work for the coming week.